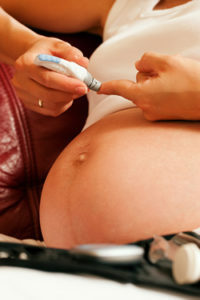 Type 2 Diabetes: Decreasing Your Risk After A Diagnosis Of Gestational Diabetes. HomeType 2 Diabetes: Decreasing Your Risk After A Diagnosis Of Gestational Diabetes. While gestational diabetes is a diagnosis unique to pregnant woman; type 2 diabetesis a familiar plight for millions of Americans. However, important new research indicates that the link between these two types of diabetes may be closer than originally believed. “5 to 10 percent of women with gestational diabetes develop type 2 diabetes immediately after pregnancy, and that women with a history of gestational diabetes have a 35 to 60 percent chance of developing type 2 diabetes within the next two decades”. If you were diagnosed with gestational diabetes during your pregnancy there arecertain adjustments you can make now to lower your risk of contracting Type 2 Diabetes in the future. Evaluate your risk: Contact your family practitioner to arrange a consultation. They will evaluate your personal and family history to determine how high your risk is for developing type 2 diabetes. Evaluate your lifestyle: Smoking, a high-fat diet and obesity all put you at a greater risk for developing type 2 diabetes. Even though weight loss, quitting smoking and changing your diet may be difficult in the short-term, the long-term benefits are well worth the sacrifices. Evaluate your commitment to health: The easiest way to make a significant lifestyle change is by correcting one thing at a time. It’s overwhelming to consider changes in diet, exercise, sleep patterns and smoking at all once. Remember that everything you do, from eating more fiber to walking an extra 1/2 mile a day, will benefit your health. Over time the small changes add up to a complete transformation in your lifestyle and, even better, your health.